This book was first released as adult fiction in 2009, then as a children’s picture book in 2012. For this review, I refer to the Young Readers Edition, published earlier this year. 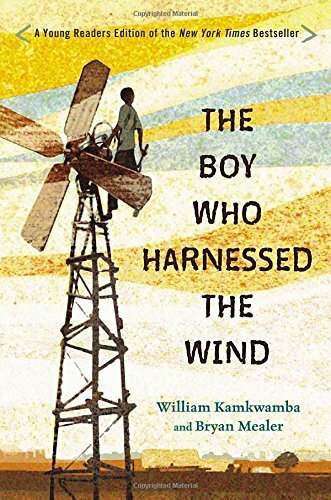 The Boy Who Harnessed the Wind is an inspirational underdog story about an African boy who changes his world through ingenuity, willpower, and imagination. Consider that, at the outset of the book—from the very title itself—the reader realizes William Kamkwamba will build a windmill. We know victory is on the horizon, yet we still fall into the book’s pages to walk at his side on this amazing path. This book’s prologue begins in the middle of the action, when the windmill is first built. Teen-aged William climbs to the top to try it out. The writing clearly evokes images relevant in William’s world: “The muscles in my back and arms had grown hard as green fruit from all the pulling and lifting.” His family, and the unbelievers, watch expectantly from below. Together with them, we celebrate William’s first success. The story then falls back to 1997 (William is nine years old) and unfolds chronologically past the scene in the prologue. William tells us where Wimbe, Malawi, is located and what the African village is like. He includes a sampling of his language and introduces his family, describing their lives as maize (white corn) farmers. Their daily porridge of maize flour and hot water called nsima is so essential to their diet that even if they were to eat a steak dinner they would say, “There was no food there.” We are immersed in the Malawi world. However, when William realizes his area’s beliefs in magic and wizardry do not work, he looks for answers elsewhere but his resources seem limited. A famine and cholera sweep the land (2001-02). William must drop out of secondary school because his family cannot pay the tuition. He recalls a recently-opened three-shelf library in a primary school; the books donated by the American government. In these science books he finds the explanations he seeks for his various tinker projects. When William sees his first photo of a windmill, his path is forever changed. William teaches himself to read the textbooks in English then he gathers discarded items with the dream to build his own windmill, improving his family’s and his village’s quality of living. One piece at a time—with many setbacks—the windmill takes shape. In November 2006, the world discovers this incredible teen and his life moves in a new direction. We realize with hopeful anticipation that William’s accomplishments thus far are merely the beginning. Today we welcome guest reviewer, Christine Van Zandt. 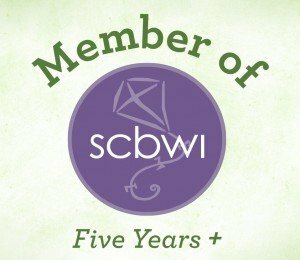 She’s a writer, editor, and owner of www.write-for-success.com. Find her on Twitter @WFSediting, and contact her at christine@write-for-success.com. Thanks for visiting the blog, Pam. 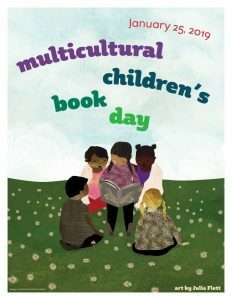 The message of this book is one that spans all age groups. Enjoyed Christine’s review… Have been wondering about this book! 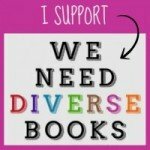 Adult fiction AND a picture book? I now realize there is lots to learn about the Malawi life and this is intriguing to many age groups. Plus this boy’s ability and perseverance to rise above his situation has something for everybody. Thanks! His perseverance is to be admired and emulated. What a role model!